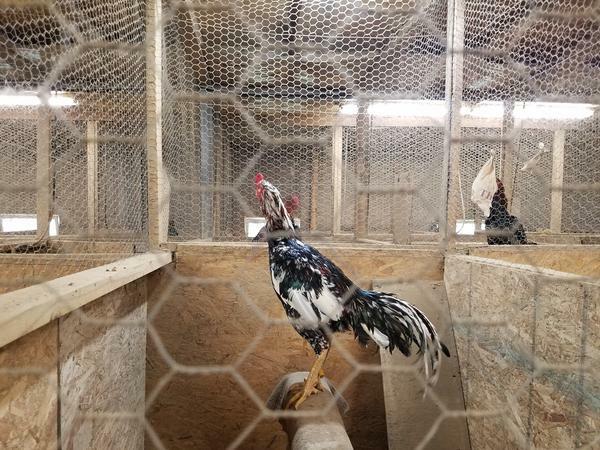 The animals were seized from a residence in Pierce County, Wis.
"You could tell they were used for fighting," Sheriff Nancy Hove told NPR. Officers found the dogs with scars and injuries. They were attached to heavy chains, "almost logging chains." The roosters' feet were cut, indicating razor blades had been attached to their feet, Hove said. Agents also found a square, wooden box – a fighting ring set up in one of the barns. Hove said the magnitude of the discovery was uncommon in their county, at least in the 35 years she has been in law enforcement. About a year ago, her agents seized some 50 dogs. "This is the second large-scale animal cruelty case we have encountered in the past two years," she said. Tim Rickey, vice president of ASPCA's Field Investigations and Response, said animal fighting "is unfortunately common throughout the country." The Pierce County Sheriff's Office discovered the animals on a return trip to the property. Agents first visited the residence on August 30 with the U.S. Marshals Service, when Yang was arrested in connection with illegal drugs.